Ride right! Ride with the speed of light! 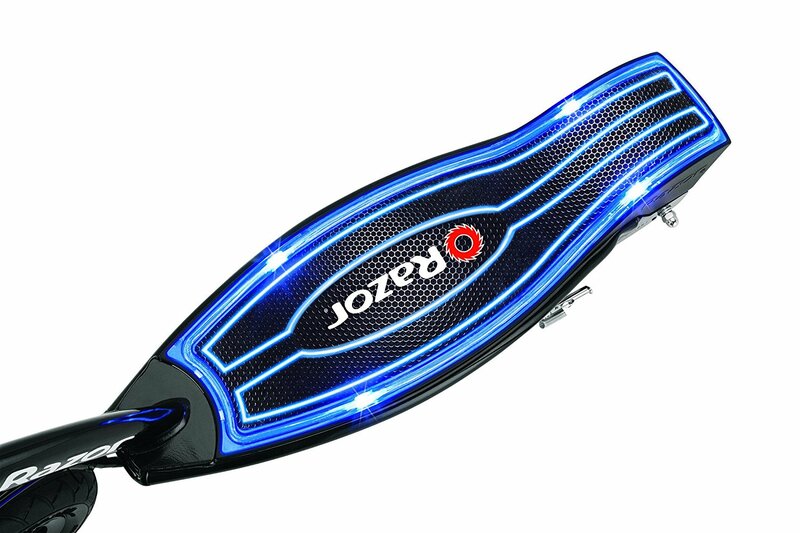 The adventurous kid will love the Razor E100 Glow Electric Scooter with the blue LED light feature on the deck which lights up with a twist of the handle. 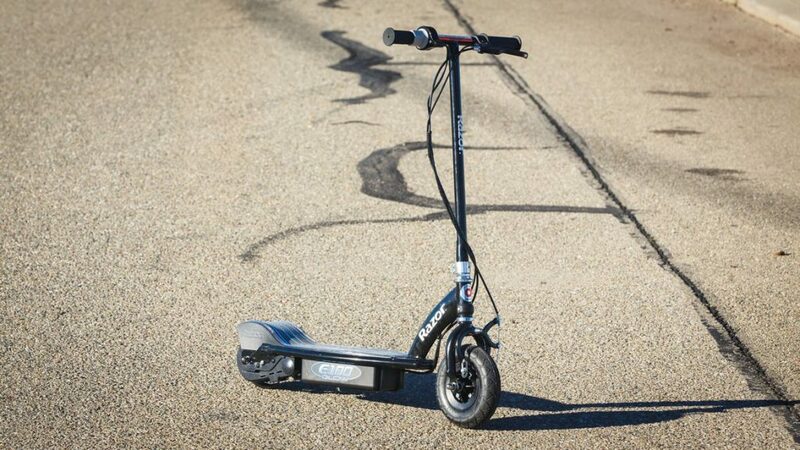 No longer the kick and glide scooter, you will find its kick and whizz features the coolest thing ever. Simply plug and recharge for a few hours and you are ready to go. The design encourages creativity while cruising through the neighborhood. This is not your ordinary kiddie scooter. 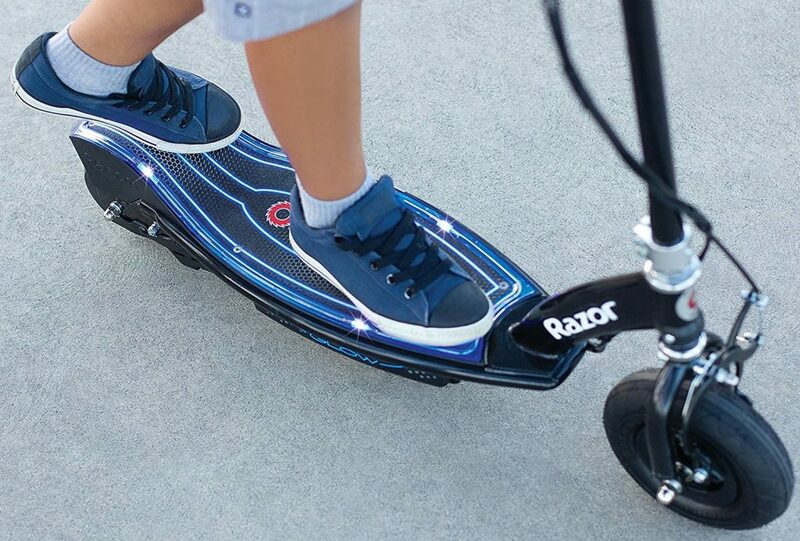 Your little explorer will love the Razor E100 Glow e-scooter’s futuristic look. Gone are the days when kiddie scooters meant flat decks and smaller wheels. 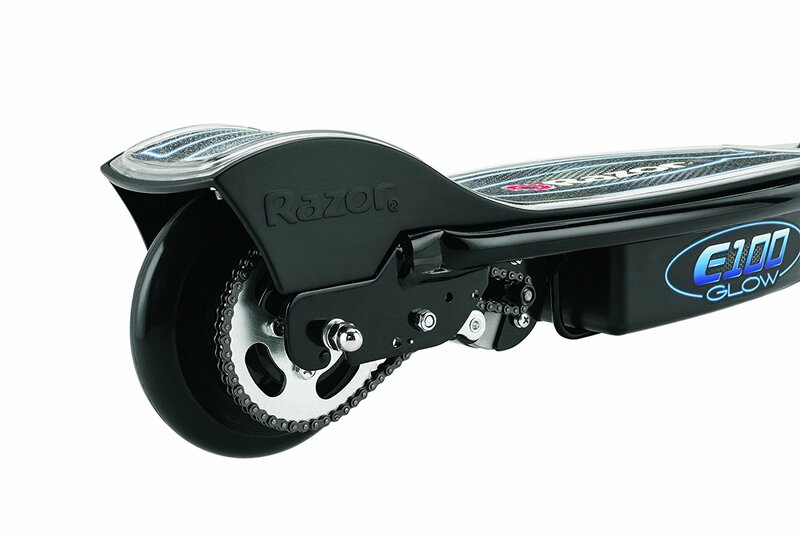 The Razor E100 Glow is the perfect e-scooter for the young adventurer but with the added grown-up zing. 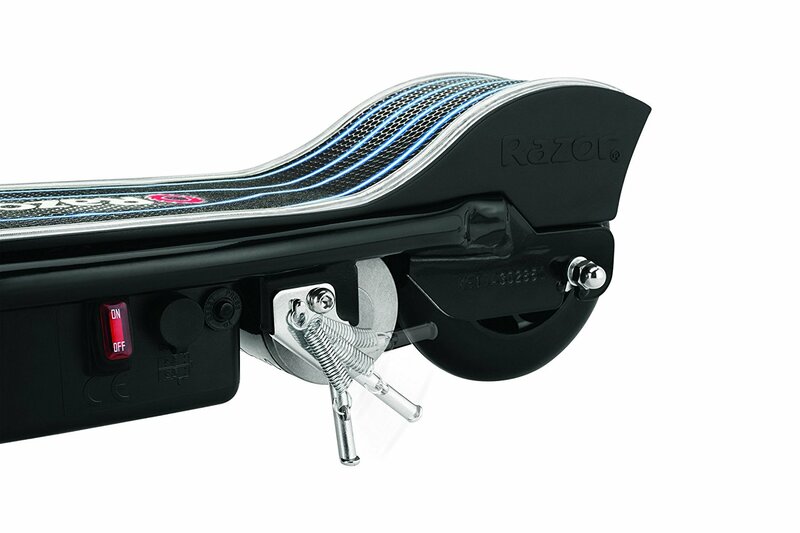 In addition to e-scooters and kick scooters, Razor is also known for Crazy Car Shifts (for drifting), ride-ons, skateboards, hovertracks and jetts (heels with wheels). 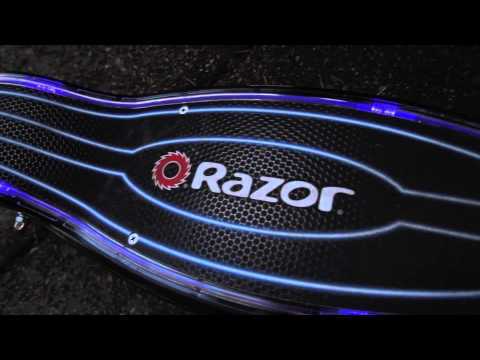 The Razor E100 Glow Electric Scooter is ideal for younger kids. It features a kick start, high-torque, chain-driven motor with twist-grip acceleration controls and a hand-operated front brake. 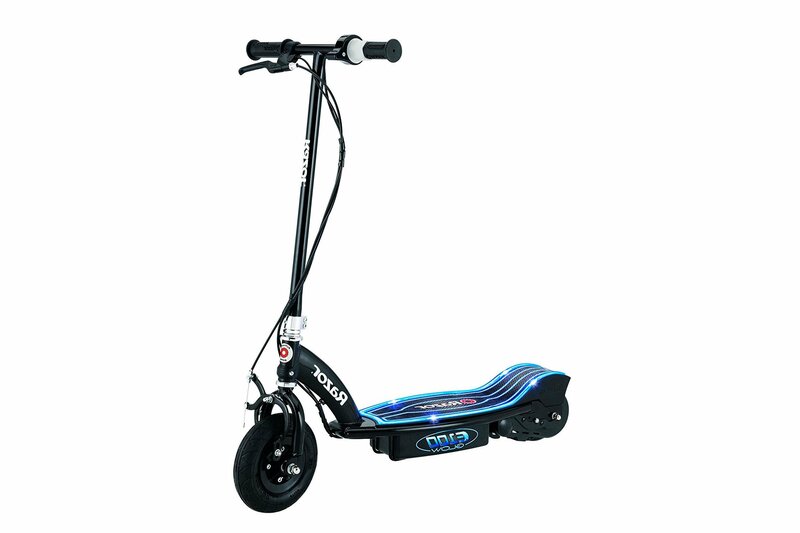 With continuous operation, this scooter can be used for up to 40 minutes. Maximum speed is 10 mph. It weighs 32 lbs, measures 35” x 8.5” x 17” and operates on a 26 volt (two 12 volt) sealed lead acid rechargeable battery system. 8” pneumatic front tires and a urethane rear wheel give this kid scooter a grown-up vibe. This model can comfortably accommodate 120 lbs. 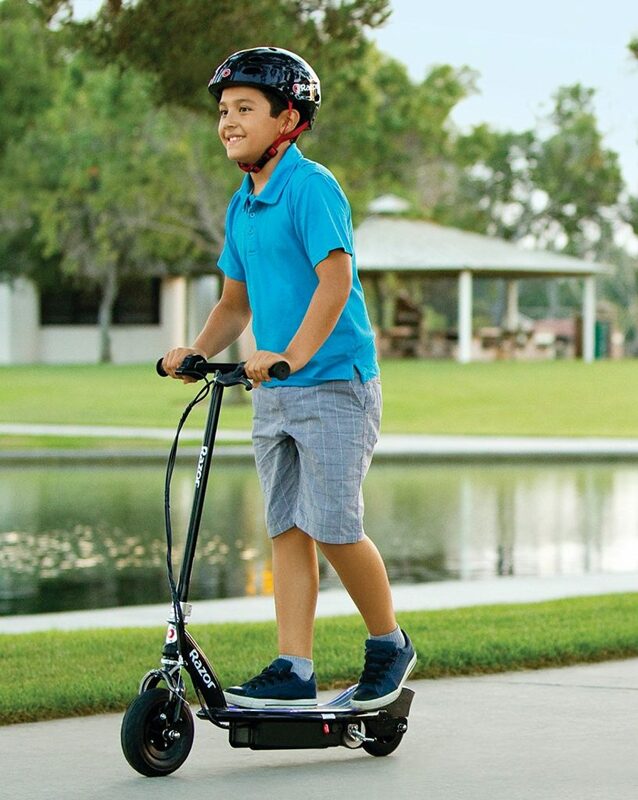 This is the perfect e-scooter for kids eight years and older. As per reviews, this model is sturdy. We have been told that battery life lasts for more than two years. While use on paved roads is recommended, kids have taken this e-scooter to the yard with no problem at all. We do advise users to first acquire balance and control. If you are upgrading from a tricycle, your child may need a bit of adult supervision for a few days. Also, this is not a free-wheeling scooter. 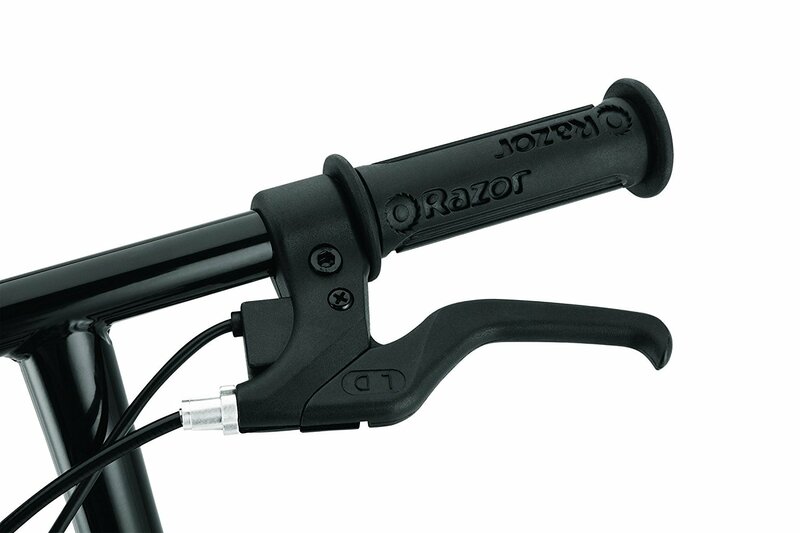 If the battery goes down, the Razor E100 Glow Electric Scooter cannot be handled manually by foot kick. Free 4K 30fps Action Camera give away, click the link if you want to participate, Rules are in the description https://youtu.be/5QV2lUylOEM. Whizz through the neighborhood with the speed of light! This is an e-scooter that lights up with a twist of the handle. Its kick start, high-torque and hand-operated front brakes make this model a perfect gift for the young rider.